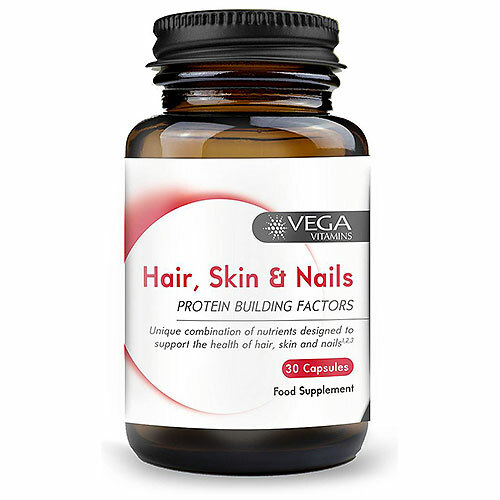 Vega Vitamins Hair Skin Nails Formula is a combination of antioxidants and vitamins with protein building factors that may be an outward reflection of inner health; keeping hair, skin and nails well maintained. The human body is made up of trillions of trillions of cells which require the right nutrients. This formula provides essential vitamins and minerals that may provide a formation of energy from foods to generate new cells for tissue growth and renewal. It may also be fortified with powerful combinations of antioxidants to bolster the body`s defense mechanism. Antioxidants are compounds that can "mop up" free radicals that may be the cause and damage to the skin and connective tissues in the body. Nutrients included may support the formation and integrity of connective tissue such as collagen, which may for all parts of hair, skin and nails. Vegetarian Capsule Shell (Hydroxypropyl Methylcellulose), Colours (Titanium Dioxide, Copper Chlorophyllin), Magnesium Oxide, Methyl Sulfonyl Methane, Vitamin C (Calcium Ascorbate), Anti-Caking Agent (Silicon Dioxide, Magnesium Stearate), Soy Germ Extract (Glycine Maxx), Iron Citrate, L-Methionine, Choline Bitartrate, Inositol, Zinc Citrate, Nicotinamide, Vitamin E (D-Alpha Tocopheryl Acetate), Para Amino Benzoic Acid, Alpha Lipoic Acid, Calcium Pantothenate, Vitamin B6 (Pyridoxine Hydrochloride), Vitamin B1 (Thiamine Hydrochloride), Cellulose, Vitamin B2 (Riboflavin), Manganese Citrate, Acacia Gum, Hydroxypropyl Methylcellulose, Copper Citrate, Sodium Selenite, Folic Acid, Potassium Iodide, Biotin, Antioxidant (DL-Alpha Tocopherol), Vitamin D2 (Ergocalciferol), Vitamin B12 (Cyanocobalamin). 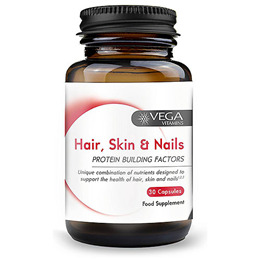 Below are reviews of Vega Vitamins Hair Skin Nails Formula - 30 Capsules by bodykind customers. If you have tried this product we'd love to hear what you think so please leave a review.